Flowrate is the quantity of fluid passing through a given section of a pipe or the like in a given period of time. 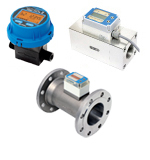 We have a wide choice of flowmeters capable of measuring the flowrate under various conditions. Most of our flowmeters are our self-developed products and are ready for quick response through nation-wide sales and service network. We can provide safe and secured flowmeters while having Japan's No. 1 flowmeter calibration facilities. In principle, positive displacement flowmeter requires no external energy such as electricity. Flowrate is calculated from the number of revolutions of a rotor(s) activated by the energy of fluid. Generally, positive displacement flowmeter offer high accuracy measurement and is suitable for totaling the flowrate. Accordingly it is used in various kinds of applications including industrial instruments. Especially, since their use was approved for taxable transactions of petroleum products by the National Tax Agency in Japan, positive displacement flowmeters have been assuming a significant role in the field of custody transfer to be certified. Coriolis flowmeter is a mass flowmeter to directly and continuously measure the "mass", the only characteristic of fluid that is not affected by the change in temperature, pressure, viscosity, and density of it. Based on a unique principle utilizing Coriolis force, wide range of mass flowrate based system can be configured by detecting the mass flowrate in high accuracy and sensitivity and converting it to analog or frequency output. In addition to general liquids, flowrate of foods, chemicals, slurry, high-density gas, etc. can be measured. A major feature of the Coriolis flowmeter is a complex sensor that can measure temperature and density simultaneously with flowrate. Vortex street occurs alternately and regularly in the right and left under a given condition downstream of an object (delta shape bluff body) placed in the flow. This vortex is called Karman vortex, enabling you to know the flowrate from the frequency caused by. Vortex flowmeter is applicable to liquid, gas, and steam. It has no moving part and features low pressure loss. It is an easy-to-use flowmeter with high durability and repeatability and is widely adopted in various fields including calorie transactions and calorie control. There are differences of operating principle in ultrasonic flowmeters. Our ultrasonic flowmeter measures the flowrate from the difference between the propagation times of ultrasonic waves transmitted and received alternately between two transducers A and B. In addition, because it adopts a method based on the inverse of propagation time difference not including sonic speed in the calculation formula, highly accurate and stable flow measurement is possible. The "multipath" model with multiple sensors placed face to face can meet the requirement for higher accuracy. Turbine flowmeter measures the flowrate from the number of revolutions of a blade placed in the flow. The speed of revolutions of the blade with an axis parallel to the flow direction is proportional to the speed of the flow. Utilizing the capability of highly accurate measurement for wide range of viscosity, the turbine flowmeter is useful for process control, transactions as well as process control of petroleum products, general chemical fluids, liquefied gas, water, etc. In addition to the model for liquid, models dedicated to saturated steam measurement are also available. The sensor unit of a thermal mass flowmeter consists of two sheath pipe-shaped sensors acting as flow speed sensor and temperature sensor, respectively. The flow speed sensor is controlled (heated) to a specified temperature difference from ambient temperature. The heat taken away from the flowrate sensor due to the fluid flow is correlated to the mass flow. Therefore, the mass flowrate can be obtained from the amount of power applied to the flowrate sensor to compensate for the removed heat. Thermal mass flowmeter features wide flow range and enables direct measurement of mass flowrate without compensating temperature and pressure. We have shipped many thermal mass flowmeters for management of energy saving. For energy saving, it is important for everyone in a company to take appropriate activities. We think that showing the effect of the activities in digital format and evaluating the effect in digital help expanding energy saving activities. We can offer inexpensive flowmeters for measuring “energy fluids” including air, steam, water, and oil. We would like to contribute to the purpose of "keeping global environment" by participating in your energy saving activities as much as possible.